Located in St. Louis County real estate, homes for sale in Manchester MO are conveniently located in the heart of the County. The residents of Manchester have access to a thriving shopping district, numerous parks, and three major highways, Hwy 44, Hwy 40 and Hwy 270. So everything is just minutes away! Manchester MO Real Estate and Manchester MO properties are a perfect addition to the St. Louis Real Estate market. Manchester real estate is made up of both well established and new construction homes. Homes for sale in Manchester MO range in price from about $150,000 to about $500,000. The median home price in 2014 was approximately $235,000. Residents of Manchester enjoy six local parks and a family friendly aquatic park. The Manchester aquatic center provides three separate pools. There is a lap pool with diving boards, a leisure pool with four slides and a lazy river and a tot pool which is zero entry to 1 foot deep. Plenty of fun for everyone! The Manchester school district is served by the Parkway school district and provides Parkway South High School, two middle schools and four elementary schools. The district also provides John F. Kennedy Catholic high school. See Great Schools for up to date ranking on every school in the area. If you are looking for a home for sale in Manchester MO or you would be interested in buying a home in Manchester, please contact St Louis County real estate expert, Sharon Colona and St. Louis Realty for a professional and simple buying or selling process. Call (636) 397-7653 or email at scolona@stlouisrealty.net. This 4 bed, 2 full & 2 half bath home with 3,300 sf. of living space in Parkway Schools is a must see! Located on a private drive shared & is walking distance to Wren Hollow Elementary's track & playground. Hardwood floors flow throughout the entire main level with amazing updates throughout. Enter into the foyer flanked by the formal living/study a wall of windows, crown molding, & wainscoting. Millwork continues into the family room/BF nook with a gas FP & sliding glass doors opening onto large patio. The kitchen boasts lots of cabinets, granite counters, SS appliances, pantry, & Bfast bar. The main lvl also has a formal dining room + 1/2 bath. MBed Suite has coffered ceiling, recessed lighting, wood floors, & stunning bath w/ sep. tub & shower, newer dual sinks, & tile floors. Upstairs also has 3 great sized guest beds with 2nd full bath. Finished walkout LL comes with rec area w/ built-ins bookshelves & a half bath. Addt'l features: NEW roof 2017, NEW Grg doors 2017, & 3 car grg. Stunning 4 bedroom 4 bath w/ over 3000 Sq. Ft. of living space & updates throughout! Vaulted family room features gleaming wood floors, brick fireplace w/ custom mantle flanked by shiplap accent wall & walk out to large 17x11 screened in deck. The gorgeous kitchen includes custom cabinets, granite counters, stainless steel appliances, center island, porcelain tile flooring & backsplash. Stunning separate dining room. Enjoy your main floor master bedroom suite w/ his/her closets & updated bathroom w/ modern vanity & granite counters. A second bedroom & updated full bath round out first floor. Second floor has sitting area overlooking family room & a SECOND MASTER SUITE w/ vaulted ceiling & updated bathroom w/ huge vanity & granite counters. Spacious finished LL has newer flooring, rec room, fourth bedroom, half bath, & walks out to a lovely professionally landscaped back yard. Newer roof, HVAC, & water heater. Location! Parkway schools- Carman Trails Elem, close to shopping & dining. LOCATION,LOCATION,LOCATION!!!!! Don x2019;t miss this opportunity for development on this .847 Lot. Across from Costco and ready for your ideas. This property is currently zoned residential with commercial potential. Ideal for medical building,day care, or church. A great opportunity with access to high traffic areas. Beautiful setting, corner lot tucked just off Henry Rd. near the lake. Lots of upgrades, almost a custom home inside and out. Spring flower have started appearing in the abundantly landscaped yard. Newer driveway, roof and gutters. A large newer covered deck for summer enjoyment!! Supper convenient location for absolutely everything! Great schools, shopping, in charming neighborhood. Upon entry, you are greeted with an open floor plan, sparkling hardwood floors throughout the main level, vaulted Great / Family Room with a gas fireplace. The gourmet Kitchen is spacious and would be any cook's delight...Custom Cherry cabinets, Breakfast Bar and stainless steel/black appliances. The large Master Bedroom Suite boasts a walk-in closet, beautiful crown molding and bath with double sinks, separate shower and garden tub. Make your way to the Lower Level to find the large Family/Rec Room, full bath and additional Bedroom/Office with a walk-in closet. Other features include main floor laundry, backyard deck, large yard, Parkway School District and easy access to I-44 and 141. Welcome home! Highly desirable 4 bedroom, 3 bath Ranch located on low traffic cul- de- sac in POPULAR SEVEN OAKS SUBDIVISION! Newly-poured concrete front porch and back patio flank this one-story home. New flooring throughout main living area. xD; xA;Bright kitchen opens to cozy family room with wood burning fireplace and sliding glass doors overlooking fenced backyard. Main floor laundry / mud-room off the kitchen. 2-car attached garage w/ workshop space. xD; xA;Spacious freshly painted, neutral living room and separate dining room create space for great entertaining. Pretty Master suite w/ updated xBE; bath & 2 additional bedrooms complete first level. xD; xA;Expansive lower level encompasses family room, wet bar, computer/study area, built in book shelves, large 4th bedroom with egress window, full bath, walk in storage closet, and 2 additional storage rooms. xD; xA;Walk to Award Winning Barrett Elementary School in Parkway School District! Convenient access to highway 270,44, restaurants, parks and shopping! Wonderful ranch opportunity in sought after Glan Tai. Recently updated high end kitchen with granite, custom cabinetry, reassessed sink and stainless. Open flowing floor plan and great natural light. New carpet and paint. New fixtures, panel doors and wood burning fireplace. Almost double your space in the finished lower level with bar, sleeping area and full bath. Fantastic neighborhood with pool, pond, tennis courts, playground and basketball hoops. Unbeatable West Co location and Parkway West. Updated kitchen with custom 42 white cabinetry w/moldings, gas range, stainless and recessed sink. Newer carpet and flooring, crown, panel doors, finished basement, wood burning FP, 4 beds plus 2 baths (true master suite) upstairs and 1 bed on the main level that is adjacent to a full bath. Maintenance free brick elevation plus vinyl siding/soffit, newer Hvac, fence and stamped patio. Rear entry garage, yard sprinkler, newer roof and windows. Located on a cul-de-sac. Parkway West. Neighborhood pool, pond, tennis courts and much more. Wonderful updated home in sought after neighborhood x2013; 5 bedrooms, 2 full bath, 2 half bath, all updated, 2 car garage, finished walkout basement, fenced yard. The home boasts an open floor plan; two story entry foyer; nice sized living room; separate dining room; updated kitchen has granite counter top, under mount sink, newer stainless steel appliances; breakfast room opens to family room with fireplace, wet bar, hardwood floor and access to newer composite deck; half bath on main floor; master suite with walk-in closet and master bath; three additional bedrooms on second floor with hall bath; All the bathrooms have been recently updated. Finished walk-out lower level with recreation room, bedroom #5/ office and half bath; Garage with new concrete floor, new driveway. Other recent updates include fresh paint through out, newer laminate floor, newer carpet, newly painted siding, new 6 panel doors, updated light fixtures, convenient location and great school. OPEN SAT 4/20 12-2pm. Recently renovated split-foyer home on over a quarter acre lot, open flrplan w/4Bd, 3Bths, 1800+Sqft of living spc including finished LL! Living RM w/vaulted ceiling, box bay window, flr-to-ceiling white-washed gas FP & opens to Dining Rm! Kitchen finds granite countertops, SS appliances, custom 42 x201D; cabinetry, custom tile backsplash, tile flring, eat-in area & access to deck overlooks yard backing to trees! Master Suite walk-in closet, updated Bth w/glass shower & custom tile surround. 2 add x2019;l Bd & full hall Bth w/newer vanity, granite countertops(2016), shower w/custom tile surround & ceramic flrs. LL Family Rm, 4th Bd, full Bth, ample storage space & laundry area! Highlights: 2 car attached garage, strand bamboo wood flring throughout most of main living area, newer carpeting(2016), newer windows(2016), recently painted interior, and a NEST thermostat. Location could not be better x2013; close to restaurants, shops, Parkway schools, and easy access to major highways. Kitchen features white cabinets, granite counter tops, ceramic backsplash & stainless appliances including smooth top stove & refrigerator. Bay windows in living, dining, breakfast & family rooms. Wood burning fireplace surround by windows. Ceramic tile in kitchen, breakfast room, master bath & main floor laundry room option. Creates extra deep garage on right side. Hardwood flooring in living, dining, family room & 1/2 bath. Newer carpeting on second floor. Master bedroom suite w/ newer flooring, full bath & walk-in closet. Light and bright home with - updated light fixtures, white six panel doors & chair rail. Finished lower level recreation room. Breakfast room leads to nice deck and level back yard backing to common ground. American Home Shield Warranty for the buyer. Fantastic Manchester home on large lot on in Parkway West. This 4 bedroom (all on main floor), 3 bath ranch has over 3000SF of beautifully finished living space! The updated kitchen features 42 custom cabinets, ceramic tile floor & backsplash, quartz countertops and stainless appliances. The sizable family room with refinished hardwood floors and fireplace opens out to the newer deck leading to the large flat backyard - perfect for entertaining. The expansive finished lower level offers another sleeping area/5th bedroom, office and full bath. Recent upgrades include: newer A/C & furnace, new 40-year architectural roof, newer gutters & soffits, new kitchen with all new appliances, & new carpet in bedrooms (hardwood underneath). Great Manchester location! Light & bright, freshly painted and new carpeting in this sprawling ranch home w brick & stone accents & substantial living spaces x2014;lots of bedrooms, wrap-around deck & finished, walk-out lower level. Double doors in formal entry opens to living rm & a family rm that has wood burning fireplace, access to deck & open staircase to LL. Living rm opens to dining rm just off kitchen. Kitchen has stainless gas cooktop, double ovens & pantry & huge window overlooking backyard & deck w breakfast rm w door that opens to deck. Main level master has private bath, walk-in closet & sliding doors opening to deck. Spacious home has four additional bedrooms x2014;two on main level that share hall bath & two bedrooms in walk out lower level w another full bath. Lower level recreation rm opens to patio & backyard, separate laundry rm & storage area. Oversized, 2 car garage. Ideal location & neighborhood w subdivision pool, tennis court, picturesque lake with walking trail & addl recreation areas. BOM-NO FAULT OF THE SELLERS! Welcome Home low maintenance beautiful villa lifestyle in a wonderful sub division of Arbor Meadows. This 1 xBD; style 3 bedroom 2 1/2 bath home features New Roof in 2017, irrigation system, large deck, luxurious wood floors, open floor plan, new carpet in bedrooms & loft area,designer paint,gorgeous kitchen w/custom cabinets,granite counter-tops,back splash,motorized window treatments,updated lighting & fixtures, main floor laundry converted into a large pantry but can be converted back if desired & updated 1/2 bath. Main floor master suite includes vaulted ceilings, walk in closet,ceiling fan, large windows & master bath suite w/double vanity. Upper level opens to a loft area perfect for an office/den or entertainment area. Two additional bedrooms with walk in closet and full updated bath. Lower Level has plenty of storage and potential for additional living space (rough-in). The attached 2-car garage completes this incredible home in a great location. Great value will not last long!!!! Come view this attractive 2 Story on a cul-de-sac street with 4 bedrooms and 2.5 Baths. Custom features such as built-ins, bead-board molding and hardwood flooring is found throughout much of the first level. The family room with a wood burning fireplace and attractive built-in shelving is fully open to the remodeled island kitchen. This bright space has granite counters, stainless steel appliances, custom cabnetry, corner sink, breakfast bar and well designed pantry with pullout drawers. A large deck overlooks a level fenced back yard with mature trees. Upstairs the spacious master suite features crown molding, 2 closets, and recently renovated bath with double sinks, soaking tub/shower combo & skylight. Three additional bedrooms each have ceiling fans and a hall bath complete the 2nd floor. Finished lower level has recreation room, a fun nook under the stairs, plus plenty of storage. All this in Parkway School District just minutes from everything! Well UPDATED (see UPDATES attachment) and carefully MAINTAINED. Great VALUE in a desired area for a 4-Bedroom/3 Bath home with 2 car garage and FENCED yard. Roomy and open kitchen/dining/living room area. Above ground POOL w/deck and patio. Home has striking WOOD floors throughout (most new). Recent UPDATES to all 3 full baths (2 on ML & 1 on LL). Kitchen has a spacious island, large pantry, double oven, gas cook top, STAINLESS steel appliances, NEW GRANITE countertop, and double doors to outside DECK. Master bedroom features large WALK-IN closet plus private MASTER BATH. Home has 2 wood burning FIREPLACES (easily made functional.) FULL BATH in Lower Level with bedroom, family room, and large utility/STORAGE area with wide and sturdy built-in shelves. (Inside pictures & more outdoor pics will be added plus disclosures soon). OPEN Saturday 4/20 12-2pm! This welcoming ranch is anxiously awaiting it's new owner! Step inside to find a freshly painted open floor plan with vaulted ceilings in the huge living room that opens to the kitchen/dining combo. The kitchen is tastefully appointed with stainless steel appliances, granite counters, & tile backsplash. The breakfast room opens to a large deck, perfect for entertaining or enjoying a morning cup of coffee. Down the hall, you will find MAIN FLOOR LAUNDRY & a very nice full bathroom that serves the two spare bedrooms. The huge master suite is fit for a king - walk in closet & full bath with separate tub & shower included! The lower level has a massive finished space - let your imagination run wild on how to use this! Family room, rec room, game room, or even extra sleeping area. There is even a huge full bathroom with lots of closet space. Attached 2 car garage with even more storage space & a great location in Parkway South SD make this home truly a steal! Quality abounds with this lovely split level. This home is in need of some updates and TLC. This is a short sale. $4,000.00 short sale fee to be paid by buyer at closing. This home is being offered as is and is subject to lien holder approval. 3407 Charleston Place Court is a perfect home for entertaining and easy living. Walk in the front door and into the two-story great room that has updated laminate flooring, a gas fireplace for cold nights, and plenty of natural lighting. The kitchen is outfitted with oak cabinetry, a breakfast bar, and a pantry. The bright breakfast room opens to a concrete patio where you can enjoy your morning coffee. The main level is completed with a half bath. The master bedroom suite is located on the second floor. This spacious room has a walk-in closet and adjoining bath with updated tile. Two other bedrooms are on the second floor with an additional full bath that also has updated tile. There is rough-in plumbing in the lower level as well as space for finishing. This home has many updates that will put your mind at ease including; HVAC in '17, water heater '14, 25-year roof '11, Radon Mitigation system '05, and many more. Come see this home today! Welcome home to this perfect location. With great access to highways 141, 44, and 40/64 and located in the top rated Parkway School District, this 4 bedroom home boasts space, convenience, and common-sense design. xD; xA;Walk through the foyer and up to the large dining area. Straight ahead is the kitchen with stainless steel appliances, eat-in area, tile floors, and natural light from the windows leading out to the deck. Then, walk down the hallway with wood floors to four bedrooms nestled into the corner. xD; xA;When you walk downstairs, you will notice the natural light and large living area for relaxation. As you go through the walk-out basement, you will come to an open and gentle flat yard great for entertaining. The two car garage is also great for a work area or storage. xD; xA;With many updates over the last few years (Anderson tilt-in windows, kitchen appliances, AC, water heater, garage door opener), this is a comfortable and modern home waiting for you. 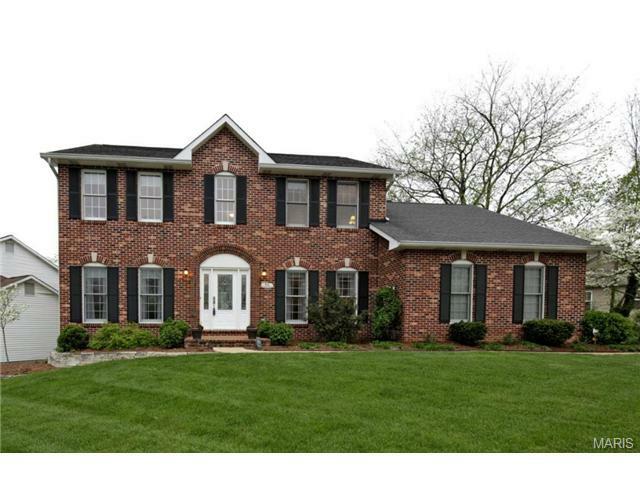 Beautiful split foyer with rare 5 bedrooms and 3 full baths in sought after Chadwick Estates! So many new items! New carpet, engineered wood floors, all windows throughout. Newer french patio door with gorgeous floor to ceiling windows brightens the lower level family room sporting built in shelving and access to lower level third full bath. Water heater replaced in 2017. Partially updated Kitchen boasts upgraded laminate counters, new breakfast bar opens to dining room, adding counter space in kitchen, a second pantry and additional cabinets, tile floors, stove, back splash. Updated counters in bathrooms and new tile flooring and shower/tub surrounds. New siding, new roof...the list goes on. Large laundry area updated. Two recent years updating this home. Additionally, the back yard play area and patio are separately fenced from rear entry 2 car garage. Near food, entertainment, and shopping. Easy access to highways. No HOA! Join Chadwick pool or Manchester pool nearby. Great Home in Parkway West! Meticulously Maintained!!! Nice Street Appeal with Brick & Low Maintenance Vinyl Siding! Attached Oversize 2 Car Garage with Concrete Drive...So Much to Offer! Approximately 1500 sq ft of living space! Bright Light and Neutral Decor! Updated Kitchen with White Cabinets and Stainless Appliances-Refrigerator, Gas Range & Dishwasher plus Built-in Microwave,Work Station/Recipe Desk in Kitchen, Bright Breakfast Room with Large Bay Window overlooks Backyard, 3 Bedrooms, 2 1/2 Updated Baths, Spacious Family Room in Lower Level with Fireplace, Lookout Windows and Walkout to Yard, Extra Workout Room or Office Room in Lower Level, Roof-Approx. 4 years old, Updated Thermal Windows Throughout. Great Lot-.32 Acre with Huge Fenced Backyard & Nice Patio...So Clean and Move In Ready... & More...A Must See to Appreciate!